Co-creation has become a buzzword in many social science disciplines, in business and in tourism studies. Given the prominence of co-creation, surprisingly little discussion has evolved around its implications for research practices and knowledge production as well as what challenges there are for fulfilling the promise of co-creation in tourism research. 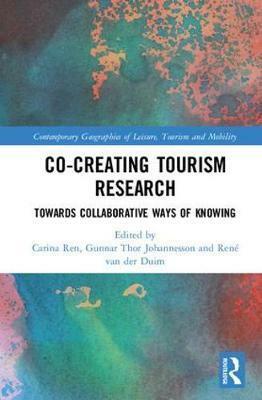 This book aims to contribute to this discussion by addressing how tourism research comes together as a collaborative achievement and by exploring different ways of collaborative knowledge production in tourism research. It is structured to offer, on one hand, an introduction to the ontological basis for collaborative research and, on the other hand, a set of empirical examples of how collaborative knowledge creation can inform tourism design, management, policy and education. The theoretical accounts and empirical cases of this book display how research collaborations can offer modest, local yet often impactful insights, traces and effects. It therefore will be of value for students, researchers and academics in tourism studies as well as the wider social sciences. Carina Ren is Associate Professor at the Department of Culture and Global Studies at Aalborg University. She is interested in how tourism interferes with other fields of the social through cultural innovation and explores new ways in which tourism is developed, organised and valued. Her research often takes place in research collaborations with tourism organisations and industry, citizens and students. Gunnar Thor Johannesson is Professor at the Department of Geography and Tourism, University of Iceland. His recent research has been on destination dynamics and place making with a focus on the entanglement of nature and culture. This has involved studies on entrepreneurship, innovation and policy making. He is a co-editor of Actor-Network Theory and Tourism: Ordering, materiality and multiplicity, published in 2012 with Routledge and Tourism Encounters and Controversies: Ontological Politics of Tourism Development, published with Ashgate in 2015. Rene van der Duim is Professor at the Cultural Geography Group, Wageningen University, the Netherlands. He holds a PhD on the relation between tourism and sustainable development making use of insights from actor-network theory. He has executed research and educational projects in countries like Thailand, Nepal, Costa Rica, Tanzania, Namibia, Kenya, Uganda, Portugal and the Netherlands and is also chair of the Association for Tourism and Leisure Education and Research (ATLAS). He has co-edited 5 books and has published his work in journals such as Annals of Tourism Research, Journal of Sustainable Tourism and Tourism Management.